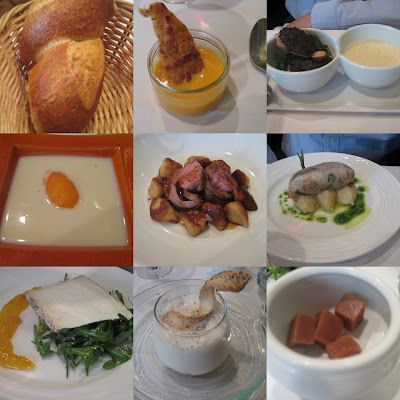 Scenes from the prix-fixe L’Epi Dupin in the 6th arrondissement. Our fourth day in Paris coincided with the beginning of the spring sales at all les grands magasins (department stores) so we went back to Le Bon Marché to take advantage of the reduced prices. I found some good bargains at Gerard Darel, Paraboot and also replenished my stock of moisturizers and face products from Lancôme and my perfume from Annick Goutal. Since two of our dinner reservations at Le Bis du Severo and 21 were cancelled by the restaurants deciding to close for Easter, we decided to make a lunch booking at a restaurant we had been to before. As we were in the Bon Marché area, we thought it would be convenient to eat at L’Epi Dupin, one of Paris’s first reasonable prix-fixe restaurants. Loaded down with our purchases, we crossed over to tiny rue Dupin and settled into our cramped table. As always, the place was packed mostly with locals but also a few Americans. L’Epi Dupin is a great bargain in the 6th arrondissement. The place is cramped, the tables are way too close to each other and the service is rushed but the quality of the food and the low prices can’t be beat. Set lunch is 25€ for a two-course meal (entree and plat or plat and dessert) or 34€ for a three-course lunch. There is a choice of about five starters, six main courses and five desserts plus a daily cheese plate in case you would rather have cheese than dessert. There are several well-chosen wines by the glass at 7€ and a pretty decent list of reasonably-priced wines by the bottle. We chose quickly as we were starving. We were served a loaf of their homemade bread to accompany the amuse-bouche of sweet potato and carrot soup with a bacon and herb cracker. Our half bottle of Sancerre rouge 2005 from Gerard Boulay was served at the same time. The soup was warm and sweet and the crispy, salty cracker was added a nice texture to the dish. For our starters, I chose the velouté of celery root with orange sorbet to start and A had the scallop and artichoke purée foam with boudin noir (black sausage) on toast. My soup was cold, which was unexpected, and it seemed a bit bland after the flavourful amuse-bouche. A‘s scallop foam was a warm taste of the sea complemented by the pureed artichokes and the excellent boudin noir. The main courses arrived soon after – the roasted sea bream with crushed potatoes for A and the lamb seasoned with sariette and crispy gnocchis for me. The fish fillet came wrapped in caul fat (the same thing used as sausage casings) to keep the flesh firm and the potatoes were like a chunky mashed potato. Mine was two pieces of tender savoury lamb with jus and several pieces of browned gnocchis, the first time either of us had crispy gnocchis. My husband had opted for cheese instead of dessert and was given a large slice of Tomme with some arugula and a peach jam while I had the banana marmalade with mango sorbet and coconut foam. The cheese was ripe and firm while my dessert reminded me of something I had as a child – the same sweetened bananas that we would eat with vanilla ice cream this time made a bit more sophisticated with the addition of the tart mango sorbet and the sweet-salty coconut lukewarm coconut foam. We ended our satisfying and reasonably-priced meal there and decided to walk towards St.Germain for our after-lunch espresso. L’Epi Dupin is a true bargain in Paris. There have been some not so good reviews recently but only from those who don’t understand the concept of a real bistro where food is served quickly and there’s not much time to linger over a meal. If you don’t want to be rushed, book a second seating table for lunch (2:00 p.m.) or dinner (9:00 p.m.) then you can keep your table for as long as you like. besides, they must be doing something right since they’ve been packed serving customers for thirteen years now. ***** Food – Excellent prix-fixe seasonal menus for both lunch and dinner and the rapport qualité-prix (quality-price ratio) can’t be beat. I had dinner at L’Epi Dupin in early May. We were given the last booking for that evening, two bar seats at the very end of the counter and right beside the kitchen. The place was packed as usual and bustling with mostly foreigner, never a good sign in Paris. Our three-course meal was disappointing to say the least – my white asparagus starter came in an orange-flavored foam and was served cold, somehow the flavors just didn’t come together and my main course was honey-roasted pork was fine but again, nothing special. My mom’s duck pastilla was a modern version of a typical Moroccan dish and was fine, her fish was okay but the portion was quite small. Instead of dessert, we opted for cheese which was a ripe Livarot, the best thing that evening which they actually didn’t prepare in the kitchen. I’ve been to L’Epi Dupin several times over the years and this time the experience was really unsatisfactory. I don’t think I’m going back. Thanks for checking in Euan! L'Epi Dupin never disappoints but next time you should also try Itineraires in the 5th – fantastic food and prix-fixe menus. 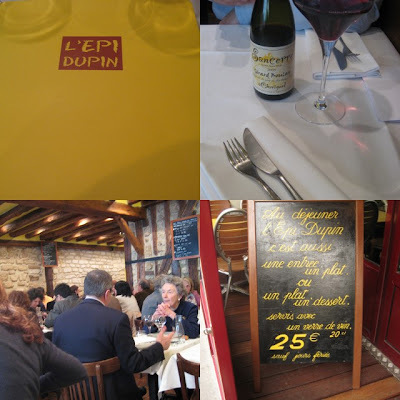 We ate at Lepi Dupin in 2008 in March and my wife and I had a great dining experience. The food was great the ambience was pure frnch and we felt as one with the locals!! Great food and a great price in Paris. We arwe going back this september and we already have our table booked. Thoroughly recommended!! !